A few weeks ago, I went to my friend Julian's art opening. 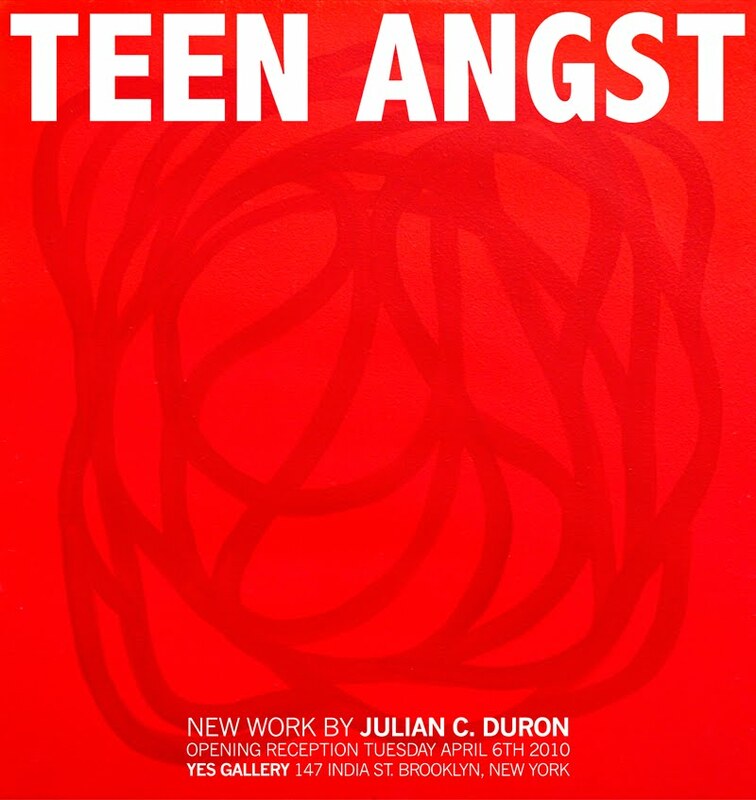 It's a good-sized show at YES GALLERY in Brooklyn called TEEN ANGST, and is up until next Tuesday, 26th April. The reception was pretty great; there was a good crowd, a tangle of bikes outside, and it was my first time seeing Julian since he was involved in producing last year's JellyNYC pool parties (PS, I heard this summer's lineup is shaping out to be hot fire). This new collection of work reflects my passion for painting together with an experimental video titled International Instructional Video Series, which in my mind acts as the sour cherry on top of TEEN ANGST. The exhibition title seemed like the best way to describe my feelings toward the compositions as a whole, boasting a hyper-color palette, fluorescent pigments, and permanent marker. Each painting is a thorough exploration in hasty mark making, meaning, investigational or instantly gratifying marks with radical variations in surface quality and finish. The addition of inscriptions into the work references themes or brands popular among the youth demographic such as Google, scum, Coke, Four Loko, Apple, etc., which I attempted to render in adolescent style graffiti within the backgrounds of each cluttered abstract still life. Most of the lumber used to build each painting surface comes from discarded or found materials, which I hand crafted into gallery style panels, and applied synthetic materials such as acrylic paint, aerosol, marker etc. This aesthetic, along with exposing raw elements of the construction on the surfaces calls attention to the materials in a Modernist sense reflecting the faux Earth conscious, here today–gone tomorrow, shabby- chic, bipolar, lazy, medicated, aloof, spastic and utter lackadaisical TEEN ANGST I have observed in art/design school and popular culture over the last few years. This blog is kind of a mixed bag (and a time capsule, by now). All material Copyright Johanna Beyenbach 2006-2013. Simple theme. Powered by Blogger.